Physical activity has long been associated with reduced risk of coronary heart disease (CHD). In this work we evaluated the effect of physical activity on lipid levels, in a sample of cardiovascular disease free people. The ATTICA study is a population – based cohort that has randomly enrolled 2772 individuals, stratified by age – gender (according to the census 2001), from the greater area of Athens, during 2001–2002. Of them, 1376 were men (45 ± 12 years old, range: 18 – 86) and 1396 women (45 ± 13 years old, range: 18 – 88). We assessed the relationship between physical activity status (measured in kcal/min expended per day) and several lipids, after taking into account the effect of several characteristics of the participants. 578 (42%) men and 584 (40%) women were classified as physically active. Compared to sedentary physically active women had significantly lower levels of total serum cholesterol (p < 0.05), LDL (p < 0.05) and oxidized LDL cholesterol (p < 0.05), triglycerides (p < 0.05), apolipoprotein B (p < 0.05), and higher levels of HDL cholesterol (p < 0.05) and apolipoprotein A1 (p < 0.05). Similar associations were observed in men, but the benefits did not reach statistical significance. However, when we adjusted for age, smoking habits and body mass index, physical activity was only significantly associated with higher HDL-cholesterol (p < 0.05) and apolipoprotein A1 (p < 0.05) levels, in women, but not in men. Substantial independent increases in HDL-cholesterol and apolipoprotein A1 concentrations were observed in women, but not in men, in a Mediterranean cohort. Lipid and lipoprotein abnormalities play a major role in the development and progression of coronary artery disease. Low levels of high density lipoprotein cholesterol and high levels of low density lipoprotein cholesterol have been identified as independent coronary risk factors . Throughout the 20th century, many investigators have focused their interest on prevention and therapy of the cardiovascular diseases through the evaluation and modification of several lifestyle risk factors. Among the factors that may influence the occurrence of cardiovascular disease the beneficial effect of physical activity on human health has been underlined in several studies [2, 3]. The protective role of physical activity on cardiovascular morbidity has, mainly, attributed to its favourable effects on several "traditional" coronary risk factors, like body mass composition, and arterial blood pressures as well as to inflammation process . On the other hand, the influence of physical activity on lipids levels showed conflicting results in the few large population studies that have evaluated this association . Therefore we sought to investigate the effect of physical activity status on several blood lipids, such as High Density Lipoprotein (HDL) cholesterol, Low Density Lipoprotein (LDL) cholesterol, Apolipoproteins (Apo) A1 and B, total cholesterol, oxidized LDL cholesterol and triglycerides, in a population-based sample of adults without any clinical evidence of cardiovascular disease. The ATTICA study is a health and nutrition survey, which is being carried out in the province of Attica (during 2001–2002), where Athens is a major metropolis. A stratified sample of 1376 men (45 ± 12 years old, range: 18 – 86) and 1396 women (45 ± 13 years old, range: 18 – 88) was drawn from the general population, with exclusion of people living in institutions. The stratification was based on the age – gender – city distribution provided by the National Statistical Service according to the census of 2001. There were only minor differences in distribution by gender and age between the study population and the target population. The study's design anticipates enrolling only one participant per household. The sampling was random. The number of the participants was determined by power analysis, and chosen to evaluate differences between the investigated parameters and physical activity levels greater than 10%, achieving statistical power > 0.80 at < 0.05 probability level (P-value). All individuals entered in this study were without any clinical evidence of coronary heart disease, stroke or any atherosclerotic disease. All participants interviewed by trained personnel who used a standard questionnaire. Any subject with co-morbidities that may affect physical activity status was excluded from this analysis. We estimated an index of weekly energy expenditure as follows: all participants were asked the average daily number of stairs climbed, and the number of city blocks walked during the week, in the past year. We next examined the type, frequency (weeks per year), duration (time per week) and intensity of sports related physical activity during the same period. Intensity was gradated in qualitative terms such as: light (expended calories < 4 Kcal/ min, i.e. walking slowly, cycling stationary, light stretching etc. ), moderate (expended calories 4–7 Kcal/ min, i.e. walking briskly, cycling outdoor, swimming moderate effort etc.) and high (expended calories >7 Kcal/ min, i.e. walking briskly uphill, long distance running, cycling fast or racing, swimming fast crawl etc.). Participants who did not report any physical activities were defined as sedentary. For the rest of the participants we calculated a combined score by multiplying the weekly frequency, duration, and intensity of physical activity. Then we calculated the tertiles of this score and the physically active participants were classified into three groups: low physical activity (1st tertile), medium physical activity (2nd tertile) and high physical activity (3rd tertile). This assessment of physical activity is reliable, valid and has been performed by other investigators in the past [4, 5]. The presence of occupational exercise was recorded but it was not taken into account for the analysis due to difficulties in evaluation and standardization. This exclusion may confound our findings, but the large sample size and the applied randomised procedure can spread the subjects who reported occupational exercise equally in both groups of the study. The blood samples were collected from the antecubital vein between 8 to 10 a.m., in a sitting position after 12 hours of fasting and avoiding of alcohol. The biochemical evaluation was carried out in the same laboratory that followed the criteria of the World Health Organization Lipid Reference Laboratories. All biochemical examinations (serum total cholesterol, LDL-cholesterol, HDL-cholesterol, triglycerides and blood glucose) were measured using chromatographic enzymic method in a Technicon automatic analyzer RA-1000. HDL cholesterol was determined after precipitation of the Apolipoprotein B containing lipoproteins with dextran-magnesium-chloride. The intra and inter-assay coefficients of variation of cholesterol levels did not exceed 9% and of blood glucose 5%. Non-HDL cholesterol was calculated by the formula: total cholesterol minus HDL cholesterol. Fasting blood glucose (mg/dl) was measured at serum. Resting blood pressure was measured with subject sitting comfortably for 5–10 minutes and the cuff arm supported at the heart level. An average of three consecutive measurements was recorded for all participants. The study's questionnaire also included demographic characteristics like age, gender, financial status (average annual income during the past three years), and education level (as an index of social status) that was measured in years of school. We also asked for the frequency of alcohol use, and this information was converted to daily grams of alcohol by multiplying each glass of beer, wine or spirits with its alcohol content (adjusted to 100 ml of 12% ethanol concentration). Information about smoking habits was collected using a standardized questionnaire developed for the Study. Current smokers were defined as those who smoked at least one cigarette per day. Never smokers those who have never tried a cigarette in their life and former smokers were defined as those who had stopped smoking more than one year previously. For the multivariate statistical analyses cigarette smoking was quantified in pack-years (cigarette packs per day X years of smoking), adjusted for a nicotine content of 0.8 mg / cigarette. Height was measured, to the nearest 0.5 cm, without shoes, back square against the wall tape, eyes looking straight ahead (visual axis is horizontal when the top of external auditory meat us is level with the inferior margin of bony orbit), with a right-angles triangle resting of the scalp and against the wall. Weight was measured with a lever balance, to the nearest 100 g, without shoes, in light undergarments. Body mass index was measured as weight (in kilograms) divided by standing height (in meters squared). Details regarding the aims and the design of the ATTICA study have already presented elsewhere [6, 7]. Continuous variables are presented as mean values ± one standard deviation, while qualitative variables are presented as absolute and relative frequencies. Associations between categorical variables were tested by the use of contingency tables and the calculation of chi-squared test. Comparisons between normally distributed continuous variables and categorical were performed by the calculation of Student's t-test and one-way or multi way Analysis of co-Variance (MANCOVA), after controlling for equality of variances (homoscedacity). In order to evaluate differences between physical activity groups we applied post hoc analysis using the Bonferonni correction. In the case of asymmetric continuous variables the tested hypotheses were based on the calculations of the non-parametric test suggested by Kruskal and Wallis. Correlations between lipids levels and age, smoking habits (in pack-years) and body mass index were evaluated by the calculation of Pearson's correlation coefficient. Associations between lipids levels and physical activity status were tested through multiple linear regression analysis after the adjustment for several potential confounders and interactions. All reported P -values are based on two-sided tests and compared to a significance level of 5%. SPSS 10.1 software (SPSS Inc. 2002, USA) was used for all the statistical calculations. Eighty-two (6%) of men and 53 (4%) of women were classified into high physical activity levels, 293 (22%) of men and 296 (23%) of women into medium, and 179 (14%) of men and 166 (13%) of women into low physical activity levels. The rest of the participants, i.e. 755 (58%) of men and 785 (60%) of women were classified as sedentary. Women were less physically active as compared to men (p = 0.062). A gender interaction was observed between physical activity status and lipid levels of the participants. Particularly, compared to women who reported sedentary life, those who defined as physically active had significantly lower levels of total serum cholesterol, LDL and oxidized LDL cholesterol, triglycerides, apolipoprotein B, and higher levels of HDL cholesterol and apolipoprotein A1. However, in men physical activity seems to be associated with the aforementioned lipids, but the benefits did not reach statistical significance (Table 1). Moreover, physically active participants were younger as compared to sedentary (44 ± 12 vs. 46 ± 12 years old, p < 0.001), and were less frequent to be active smokers (52% vs. 59%, p = 0.004). An inverse association was observed between body mass index and physical activity group (sedentary: 27 ± 5 vs. low: 26 ± 5 vs. medium: 26 ± 4 vs. high: 25 ± 4 Kg / m2 , p < 0.001). Also, compared to sedentary physically active participants had lower levels of systolic and diastolic blood pressure (122 ± 19 vs. 120 ± 17 mm Hg, and 79 ± 14 vs. 77 ± 12 mm Hg, p < 0.001), as well as blood glucose concentration (94 ± 31 vs. 90 ± 28 mg / dl, p = 0.113). No associations were found between indexes of social status (education level and annual income), alcohol drinking and the adoption of a physically active lifestyle. We further examined the associations between physical activity status and lipids levels through multivariate analysis. Firstly we observed that all lipids measurements were significantly correlated with age (rtotal cholesterol = 0.25, rHDL = -0.10, rLDL = 0.21, rapoA1 = -0.07, rapoB = 0.28, roxidLDL = 0.10, all p < 0.05), body mass index (rtotal cholesterol = 0.11, rHDL = -0.17, rLDL = 0.27, rapoA1 = -0.12, rapoB = 0.19, roxLDL = 0.09, all p < 0.05) and smoking habits (rtotal cholesterol = 0.15, rHDL = -0.12, rLDL = 0.06, rapoA1 = -0.08, rapoB = 0.23, roxLDL = 0.06, all p < 0.05). Thus, after taking into account the confounding effect of age, body mass index, dietary intake, and smoking, we observed that physical activity was positively associated with HDL – cholesterol and apolipoprotein A1 levels, in women but not in men (Table 2). Post hoc analysis revealed that women at medium and high physical activity levels had significantly 6% (p < 0.05) and 9% (p < 0.01) higher HDL-cholesterol levels, respectively, as compared to sedentary. Similarly, women at medium and high physical activity status had 3% (p = 0.12) and 6% (p < 0.01) higher apolipoprotein A1 levels, as compared to sedentary. Furthermore, when we stratified the analysis according to smoking status we found that compared to sedentary medium physical activity was associated with lower total cholesterol levels both in nonsmoker men (-7%, p = 0.032) and nonsmoker women (-2%, p = 0.064), as well as lower triglycerides levels in nonsmoker men (-15%, p = 0.086) and nonsmoker women (-9%, p = 0.036). No differences regarding total cholesterol or triglycerides levels were observed between low or high physical activity status and sedentary life. No other statistically significant differences between physical activity status and lipids levels were found when we stratified the analysis by body mass index group (normal, overweight and obese), both in men and women. Table 2 illustrates the effect of physical activity on the investigated lipids measurements after taking into account the aforementioned confounders. Physical activity entered in the models as an ordered variable according to kcal/min expended per week (i.e. sedentary, low, medium, and high). Covariates entered in all models are: age (years), body mass index (Kg/m2 ), dietary and smoking habits (pack-years). 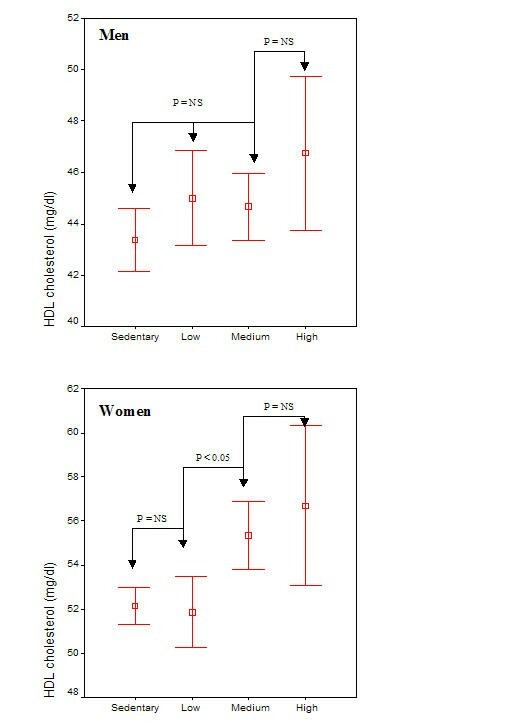 In this work, based on a large population-based sample of cardiovascular disease free people, we revealed a statistically significant dose-response relationship between physical activity and HDL-cholesterol and apolipoprotein A1 levels in women, but not in men, after adjusting for age, body mass index and smoking habits of the participants (Figure 1). Inverse linear associations were also observed between physical activity and triglycerides, LDL cholesterol, total cholesterol, and apolipoprotein B levels. However, the benefits from physical activity on these lipids were, mainly, explained by the observed differences in body mass and smoking habits among the physical activity groups. Numerous studies documented the relation of increased physical activity with an improved cardiovascular risk factor profile in adults. In particular these studies have shown the overall benefit of physical activity in reducing the risk of developing coronary heart disease, especially due to the reduction of arterial blood pressure levels [8–11], inflammation and coagulation markers [7, 12]. One of the main findings of the present work is the dose-response relationship between physical activity and HDL cholesterol levels, in women. Particularly, women at medium and high physical activity levels had 6% and 9% higher HDL-cholesterol levels, respectively, as compared to sedentary. Similar results were observed in apolipoprotein A1 levels. It is notable that the previous associations were independent from the effect of body mass index, smoking habits and age of the participants. The Pawtucket Heart Study reported that physical activity was significantly associated with lower blood pressure as well as body mass index and higher HDL-cholesterol levels . Moreover, among 3000 adult Japanese men frequency of physical activity was independently and positively related to HDL-cholesterol . Similarly, a pooled analysis among three European cohorts consisting of a total of 402 elderly men demonstrated a significant relation of physical activity with HDL-cholesterol . The same findings were observed in several studies that included only women [16–18]. Our insignificant findings regarding physical activity and HDL or apolipoprotein A1 levels among men, could be attribute to the differences on body mass composition, and smoking habits between physical activity groups. The present study cannot provide causal inference about the effect of the gender interaction with physical activity on HDL cholesterol and apolipoprotein A1 levels. Potential differences on eating habits between men and women, that they were not evaluated in the present analysis, could the answer in the stated hypothesis. We also evaluated the effect of physical activity on several other lipids levels. Particularly, we observed that compared to sedentary physically active men had a reduction that varied from 3% to 11%, in all lipids measurements. In women, we also observed a reduction starting from 5% to 18%, in all lipids, with the most significant reduction in triglycerides (18%). However, we revealed that the benefits from physical activity on total cholesterol, triglycerides, LDL cholesterol and apolipoprotein B levels were mainly explained by the reduction in body mass index and the decreased smoking habits among physically active men and women. Our findings are in accordance with several other observational studies that reported a non significant effect of physical activity on lipids levels, by the exception of HDL cholesterol and triglycerides [14–19]. Regarding the intensity of physical activity that is needed for a considerable lowering on lipids levels several investigators report that positive changes in HDL cholesterol levels observed in those who were highly exercised, i.e. at least 12 – 15 miles per week [19, 20]. Although, it is difficult to compare results among studies, because different methods were used to classify physical activity levels, our study revealed that even medium physical activity levels (4 – 7 kcal/min, > 3 times per week) was associated with a significant reduction in HDL cholesterol levels, among women. Three or more times per week, along with relatively moderate intensity and duration, are within the ability and tolerance of most middle aged and older individuals. It is widely accepted that exercise affects blood cholesterol and other lipids in a positive way, by regulating the metabolism of all lipids in the blood. Several studies, including the present, demonstrate that exercise raises HDL-cholesterol in the blood. Another major impact of exercise on lipids is that it lowers triglyceride levels . However, exercises exert a minor impact on the LDL-cholesterol and to a lesser extend, total cholesterol. In fact dietary interventions have much better luck in lowering blood cholesterol levels . The latter could be viewed as disappointing concerning the effect of physical activity. However, some investigators suggest that the way to avoid a decline in HDL-cholesterol that occurs with dieting is to combine diet with exercise. It has been shown that those who decrease their fat intake through dieting, but maintain an active exercise program, note an increase in HDL-cholesterol levels [1, 19]. Thus, if we use the above example, one can easily realize the benefits of reducing cholesterol through dieting while HDL-cholesterol are maintained. As a result, those who exercise regularly have a more favourable lipid profile than those who do not exercise. This may translated to a reduction in the risk for developing atherosclerosis . How much exercise is required to increase HDL-cholesterol levels and improve the overall lipid profile? Our study revealed that even medium exercise is adequate to increase HDL-cholesterol levels, in women. Our study is a cross section survey. Thus, we cannot provide evidences for causality between physical activity and lipids levels. The self-reported history of weekly physical activity is also a limitation. This work is also limited is assessing the effects of an intensity – duration interaction on lipid and lipoprotein metabolism. In addition, the influence of diet and genetic factors cannot be addressed by our data. All these issues need to be addressed by future interventional exercise studies. Nevertheless, physical activity was associated with reduced lipids levels, both in men and women, but these benefits did not reach statistical significance when adjusted for the effect of exercise on body mass index of the participants and the confounding effect of smoking and dietary habits. On the other hand, substantial increases in HDL cholesterol and apolipoprotein A1 concentrations were observed in women who exercised even at medium levels. The authors would like to thank the field investigators of "ATTICA" study: Dr M Toutouza (biochemical evaluation), Dr E Tsetsekou (physical/psychological evaluation), Dr A Katinioti (physical examination), Dr S Vellas (physical examination), Dr D Masoura (physocal examination), Dr L Papadimitriou (physical examination), Ms M Toutouza (data management), Mr E Kambaxis (nutritional evaluation), Ms K Paliou (nutritional evaluation), Ms C Tselika (technical support), Ms S Poulopoulou (technical support), and Ms C Vasiliadou (genetic evaluation). The ATTICA study was supported by research grants from the Hellenic Cardiological Society (HCS2002), the Hellenic Atherosclerosis Society (HAS2003) and the Hellenic Heart Foundation (HHF2001-HHF2002).